To create a spreadsheet you will need to first export data OUT of Caseload Manager and then import it IN to Excel or Word. This walks you through every step of exporting out and importing in. This is a step-by-step guide to importing your Contacts List into a Spreadsheet. 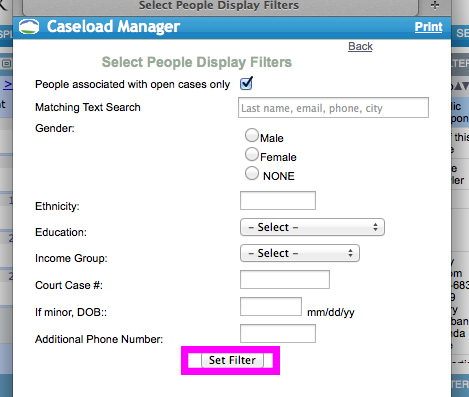 You can use the same instructions for cases, calendar items,and staff, simply begin in that Hub. The rest of the instructions will be the same. The example below shows how to make a spreadsheet, which you can then use to make address labels from your Participants list. The same process can easily be used to merge the information into a document, such as a Mediation Agreement, Intake Form, Evaluation, Case Report, and so on. You may also export your calendar items to create a ToDo List, your staff members to create a list of trainees, and so on. 1) Begin by Clicking on EDIT, then selecting your Participants. You may choose All People (these are all of your clients, not all of your staff), or you may choose a certain people group (such as lenders, donors, children, etc.). 2) Next a window will pop-up. This window will list all of the fields that you have selected to display relevant to your participants. To select which fields you will export, click Select Fields. 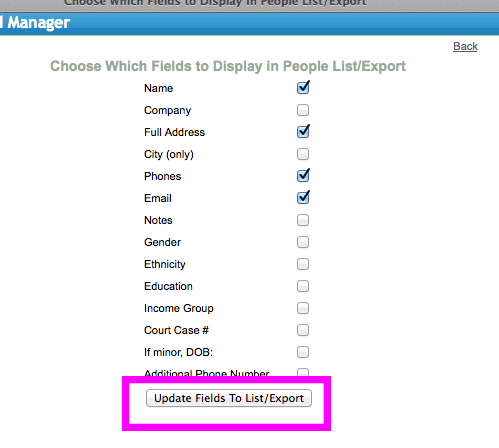 Check which fields you want included in your export, then click Update at the bottom. 3) You may also filter the items that appear in your export. To narrow down the amount of participants you see, Click Filter on the list of participants, and enter in your filter criteria. Then click Update at the bottom of the window. 4) After you have the right fields selected, on the Participant List window select EXPORT. The data will then export to your computer (you can change where your export saves, typically either your Desktop or your Documents). ***If you are using Microsoft Excel 2013, please click here as Microsoft has additional import information. 5) Next, open up your Microsoft Excel. Click File, then Click Open (Newer versions allow you to click File, then Import.). 6) Open up the data file. It will be named Participants"YourUserId"-tab.txt. (If you exported cases, it will be "cases_____tab.txt"). (Please Note: this is a .txt file, not an Excel file, so you might need to Enable All Readable Documents (Mac), or Open All File Types (PC). 10) Now you have a Microsoft Excel Spreadsheet with all of your data. You can archive this as a Back-up on your Personal Computer, or you can use this to create your own reports. 11) To create mailing labels, you can export into Microsoft Word an use their Mailing Labels Mail Merge, or most Excel programs allow you to print to labels directly from your Excel spreadsheet.